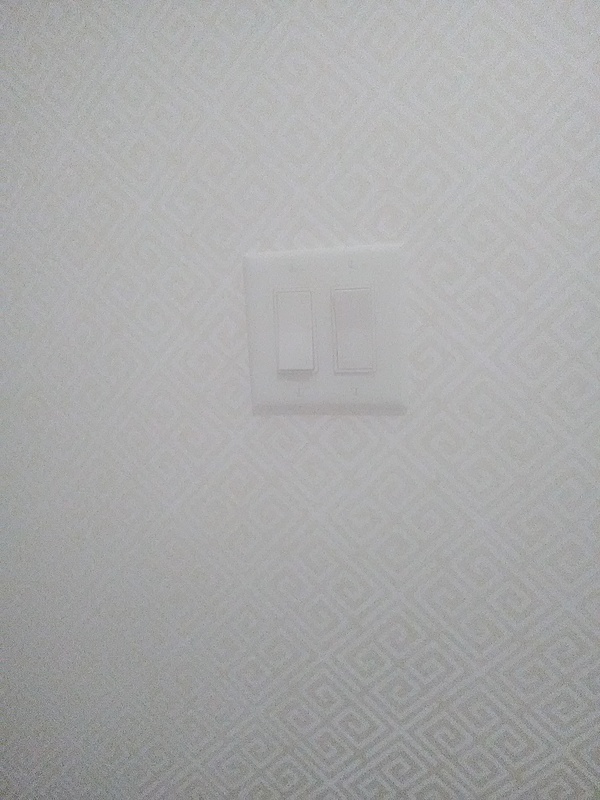 I don’t like covering switch plates or outlet covers with wallpaper, nor things like air conditioner grills. They get dirty when hands touch them, no adhesive wants to stick to them, they just look better the way God created them. So don’t tell anyone that I did this…. 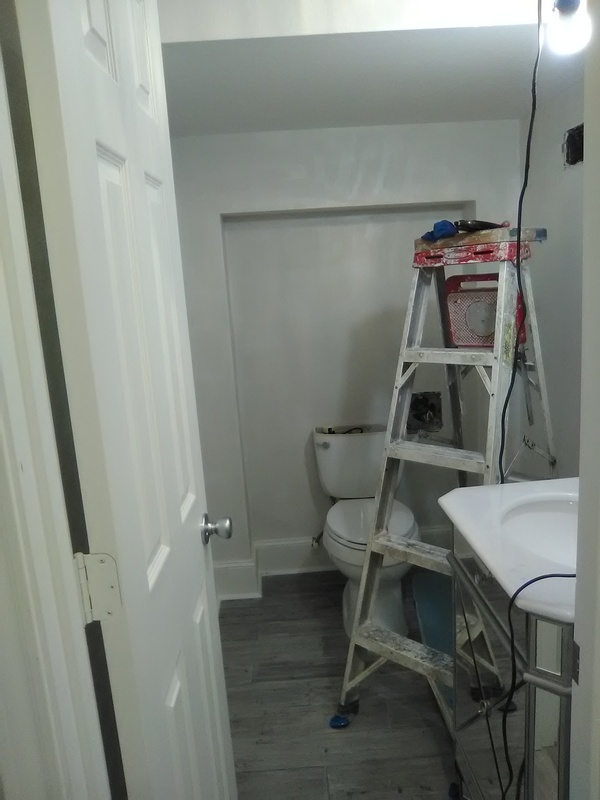 This exhaust fan was oddly stuck smack in the line of sight, in the wall next to the toilet. (Most are mounted inconspicuously in the ceiling.) It just kept bugging me. Since the family was out of town and I had plenty of peace and quiet and time, I decided to give ‘er a go … I plopped down on the floor and spent a good 45 minutes with a handful of new razor blades and cut out all these tiny vent slits. I hope it holds up. 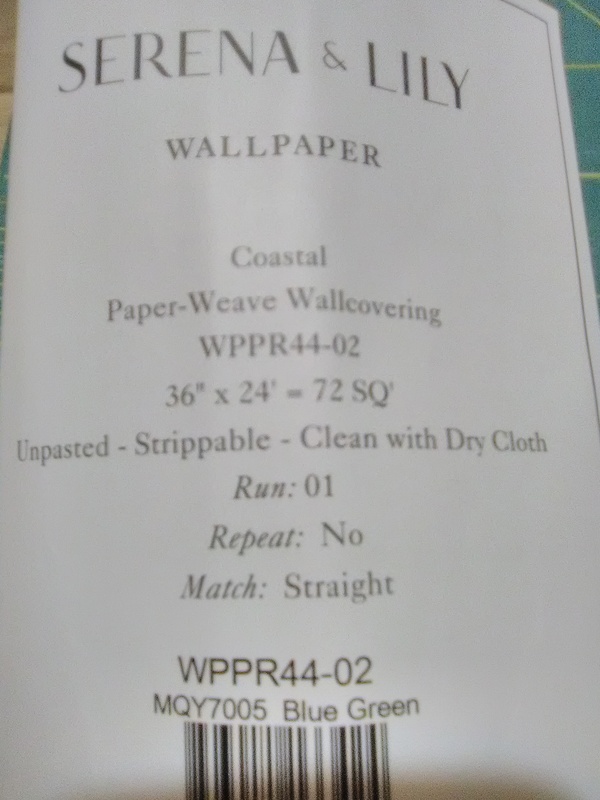 Wallpaper adhesive is not formulated to stick to plastic. But it’s all I had with me. I did use sandpaper to scuff up the surface of the plastic vent cover, and also used a bit of adhesive caulk – one of my secrete weapons – in a few areas that were reachable (couldn’t get down into the recessed areas). 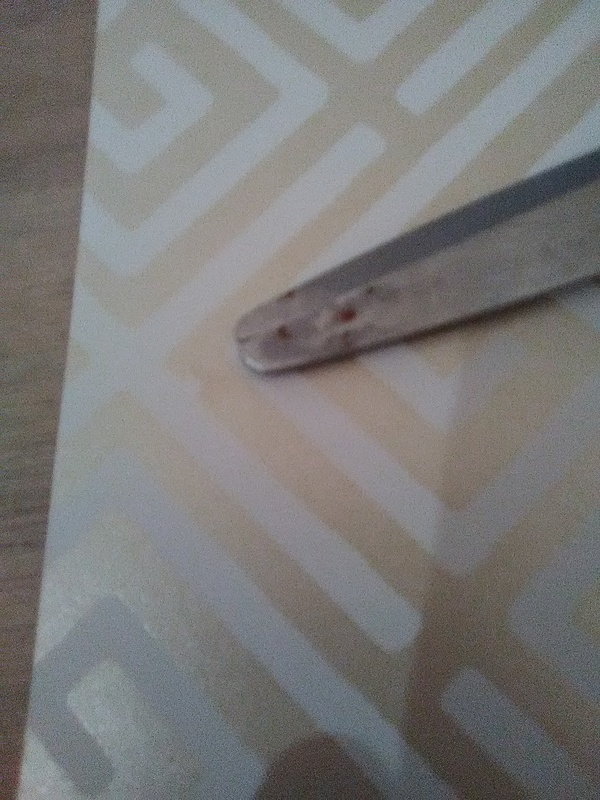 So hopefully there will be some chance for the paste to grab ahold. The end result was worth the effort. Now you barely notice the exhaust fan. 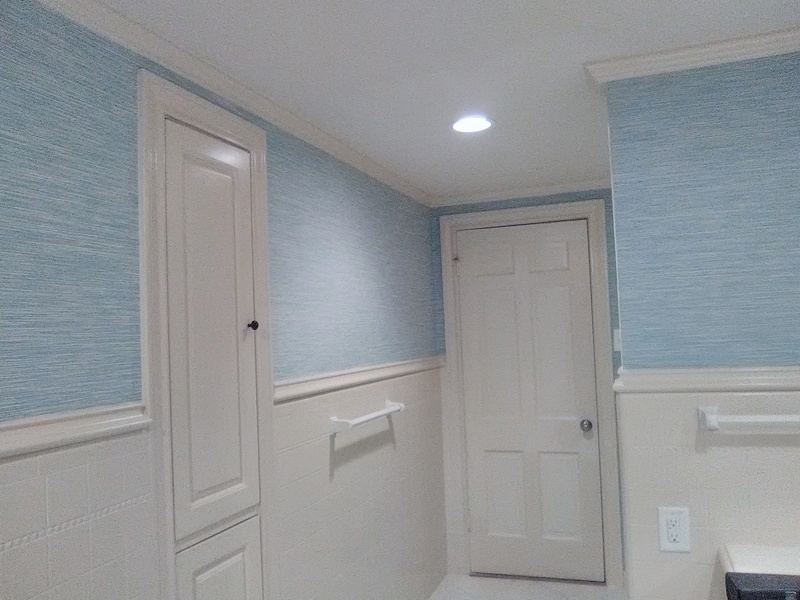 I wallpapered the nurseries for this client in her two previous homes. (Don’t ask me how old the kids are now! 🙂 ) Her current home in Bellaire was flooded during Hurricane Harvey. During the rebuild, this homeowner took the occasion to freshen and update the look of her ’90’s era home. 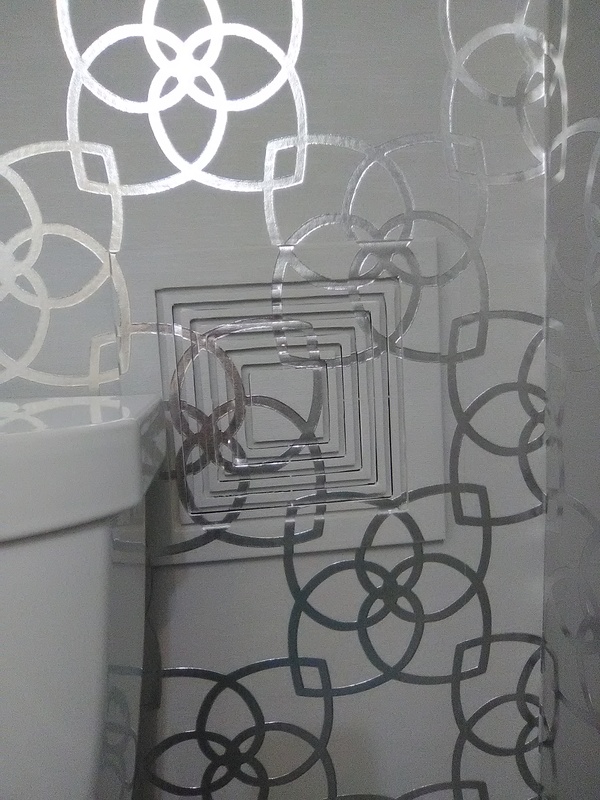 This shiny, curvy geometric wallpaper pattern fills the bill perfectly. 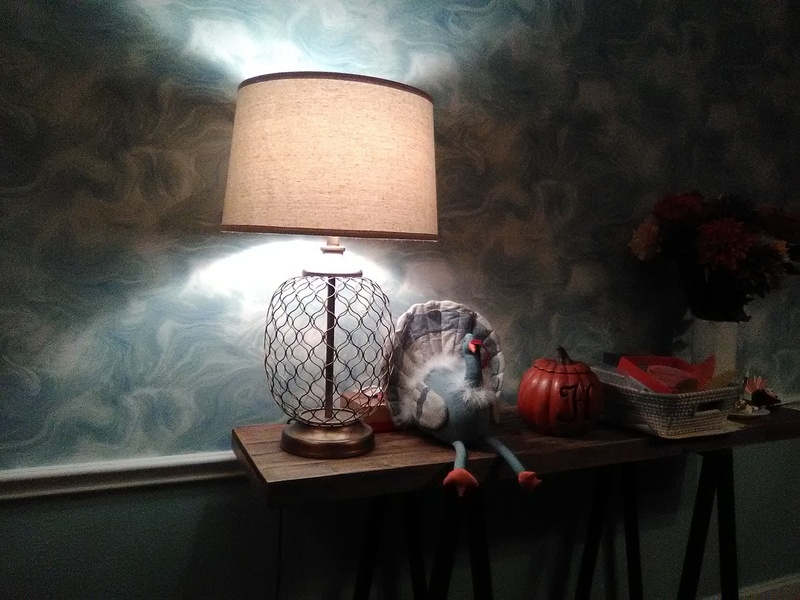 The soft silver color compliments the new distressed grey wood-look floor tiles, and the sheen and design play wonderfully off the new contemporary chandelier (sorry, no picture!). 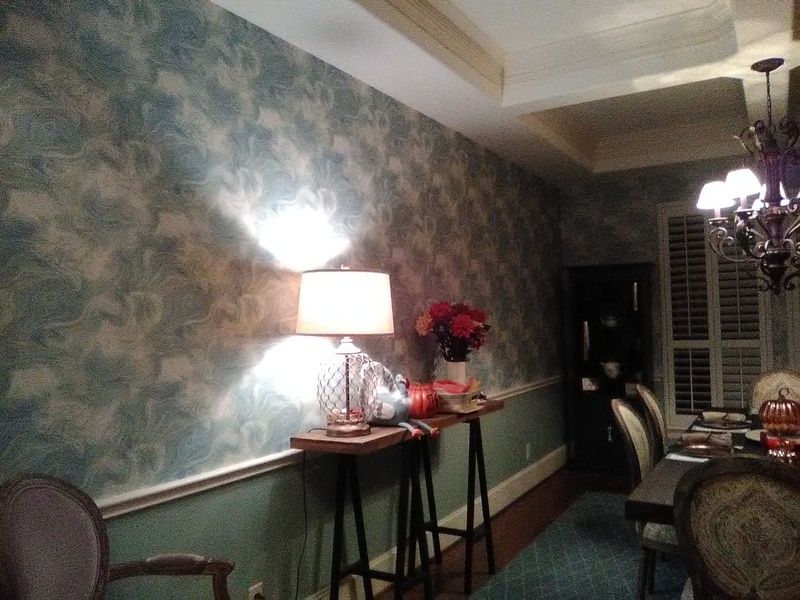 I usually have a long lead time, but this client was planning to host a party early next month and wanted her paper up, so I figured it was better to stay away from Black Friday shopping and hang wallpaper instead. 🙂 The homeowner was out of town, but she was able to let me in each day via remote-access, and I had the privilege of working in peace and quiet with no distractions or worries about disturbing the family. That peace and quiet enabled me to do some intricate things… things that make the job look better, but that the average person wouldn’t be able to put a finger on. Like I say … something that is easy to LOOK at, but that was tricky and time consuming for me to PLOT AND EXECUTE. 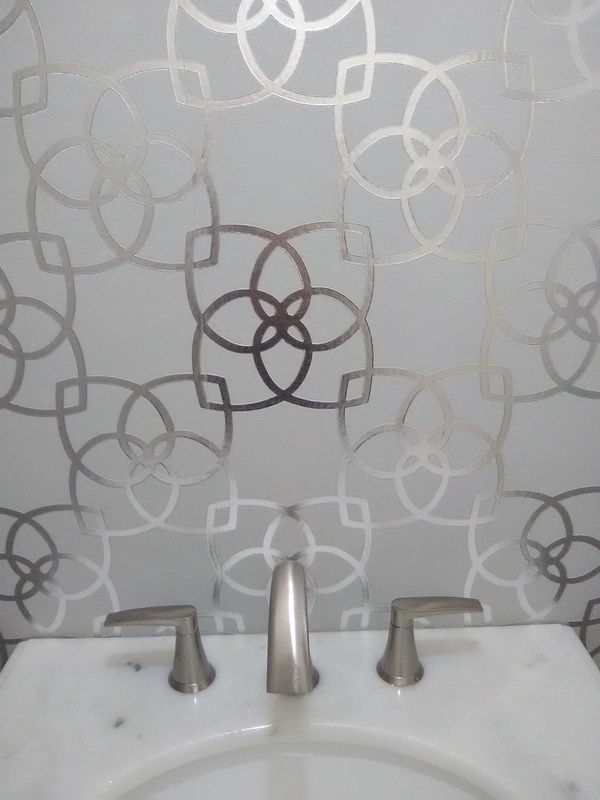 For instance, you will notice that the wallpaper pattern is balanced / centered perfectly behind the sink / faucet. 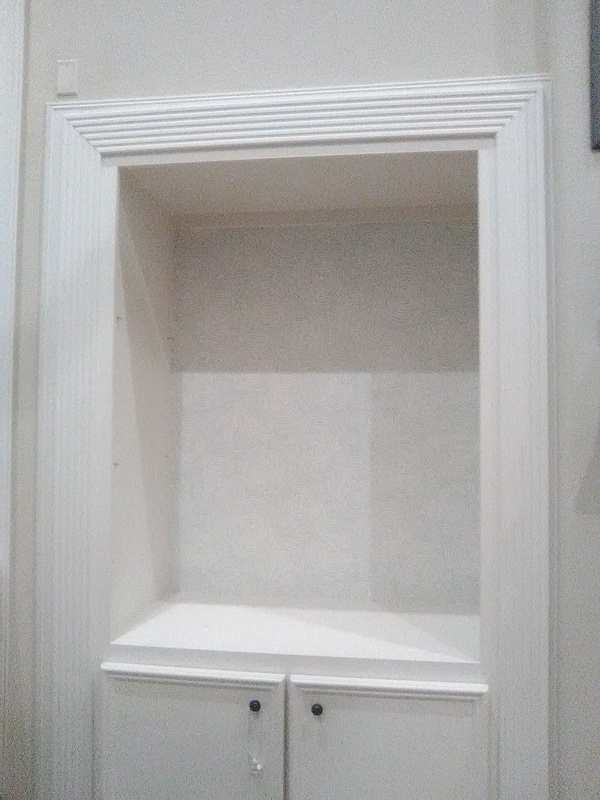 And that funny little alcove that the toilet is recessed into (what architect thinks these things up, to accentuate the toilet with it’s own little niche?! )… It took a fair amount of engineering to lay everything out so that the pattern would fall evenly above the niche and then down either side. 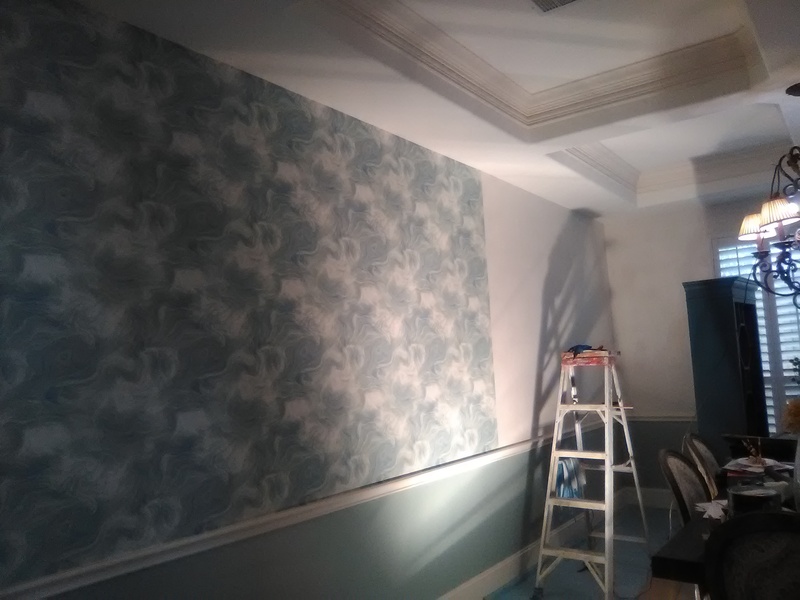 Then the back wall was hung, with care taken that the pattern matched up with the pattern on the header above, as well as the walls on either side. This meant that the pattern DIDN’T match on either the right or left corners inside the niche, nor the horizontal corner at the top back. But these areas are not very noticeable. 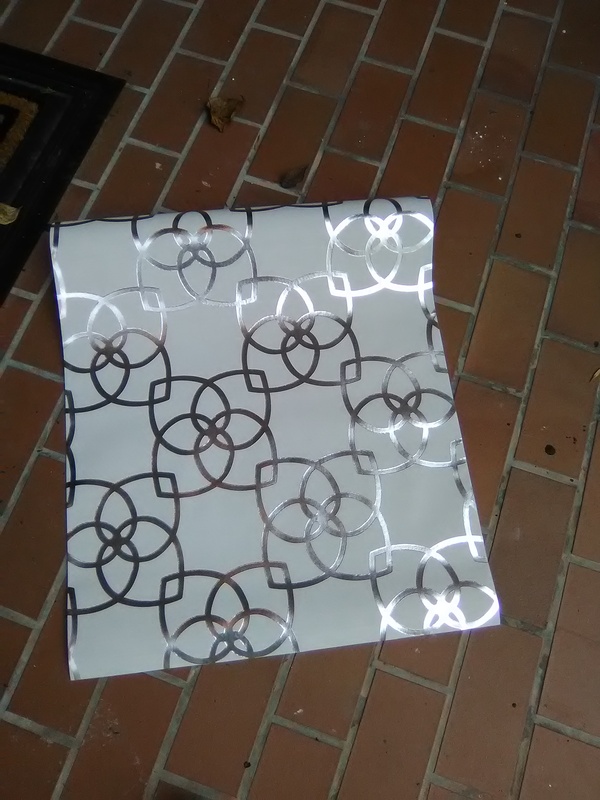 I felt it was more important to make the pattern match when it is seen by someone who is standing outside the room and walking in – which is the view you see in the photograph. 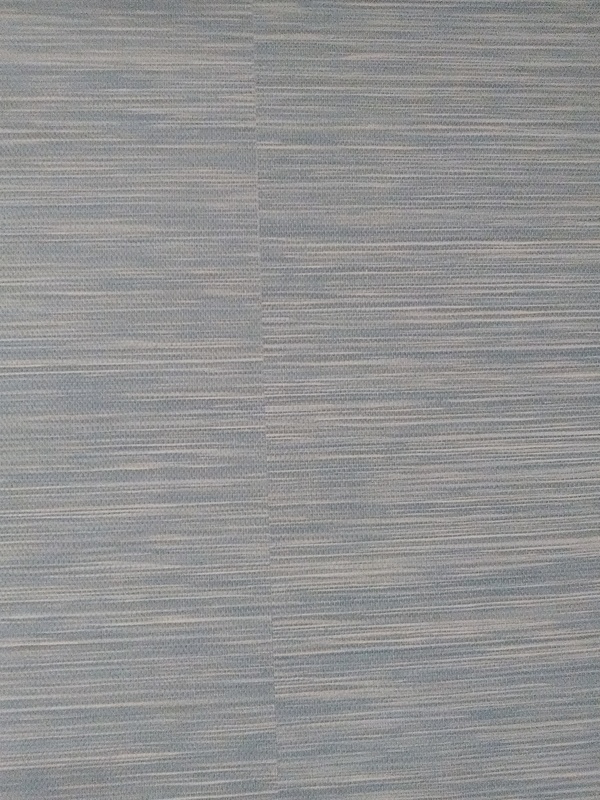 This room also had another “hidden corner” (not shown) where I elected to allow the pattern to not match. 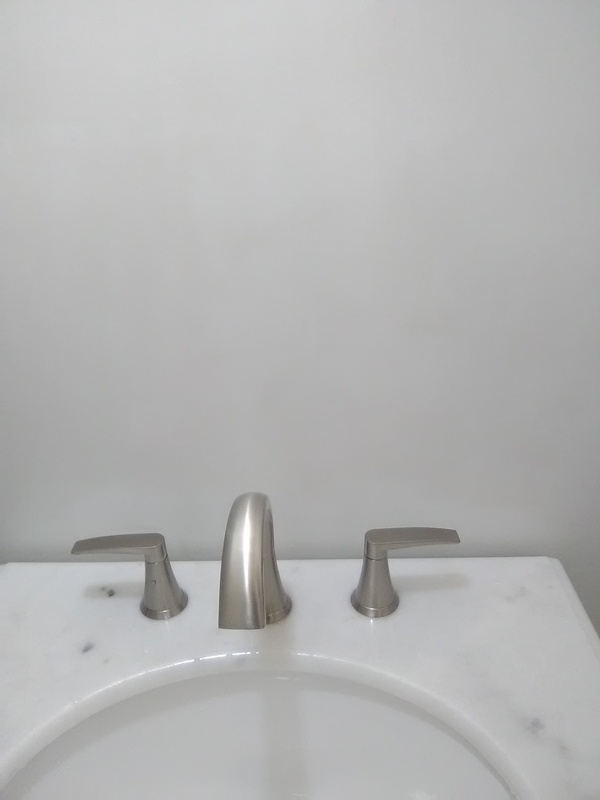 This gave me the freedom to balance / center the design on the vanity and sink, and, as explained above, in the toilet niche. Hard to explain, and hard for you readers to follow and envision. But the end result is a room with several perfectly balanced focal points, and a really professional look. I am so happy that I was able to invest the time to pull all this together. 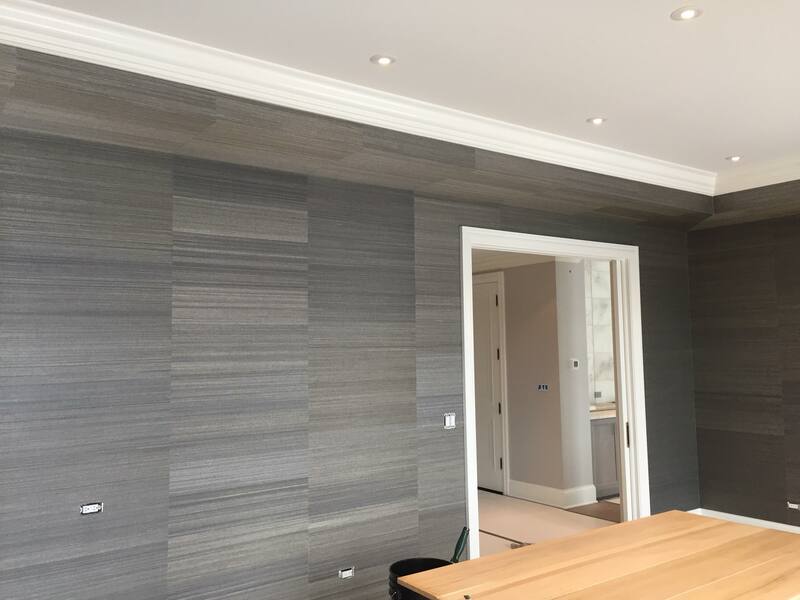 The finished room looks amazing. 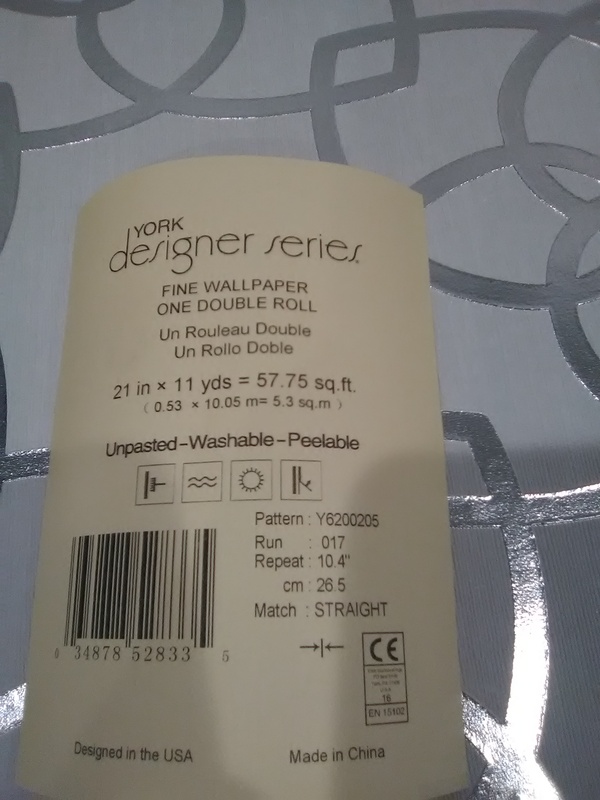 This wallpaper pattern is by York, in their “Designer Series.” It is a textured vinyl product on a thin, flexible non-woven backing, and was a joy to work with. 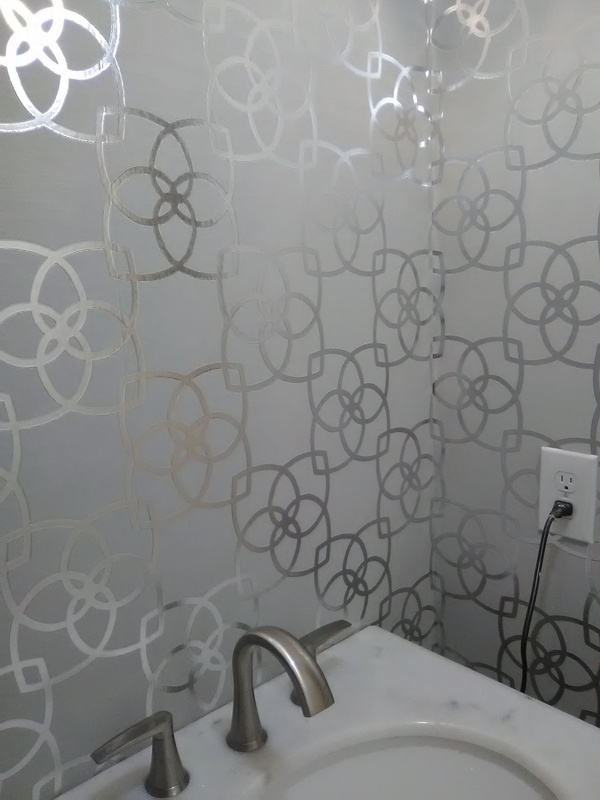 It was pretty resistant to creases, and it will hold up against water splashes better than other types of paper – a good choice for this powder room. It is designed to strip off the wall easily down the road when it’s time to redecorate. I have hung this twice before, in two different colors. 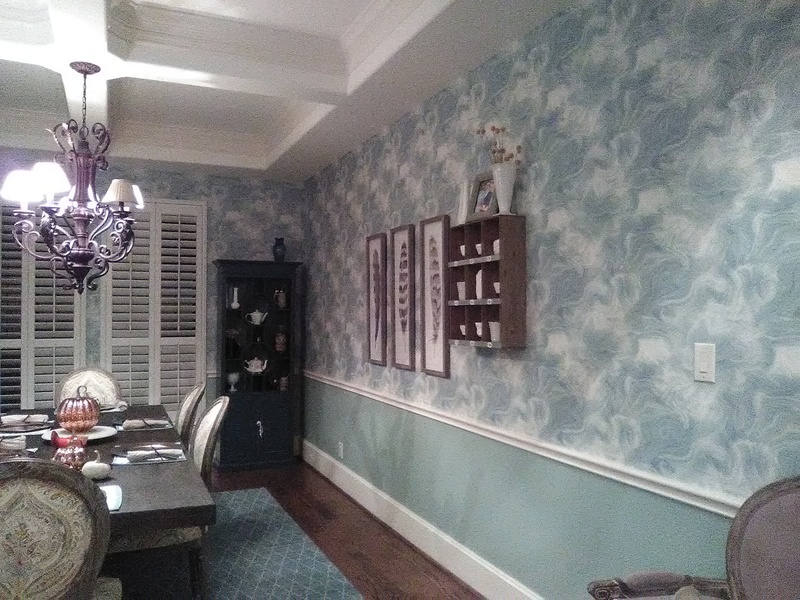 This wallpaper was bought from my favorite source for good quality, product knowledge, expert service, and competitive price – Dorota Hartwig at Southwestern Paint on Bissonnet near Kirby. (713) 520-6262 or dorotasouthwestern@hotmail.com. She is great at helping you find just the perfect paper! Discuss your project and make an appointment before heading over to see her. This soft gold metallic-on-white background Greek key pattern doesn’t show up well in the photos but, boy, it really changed the room! 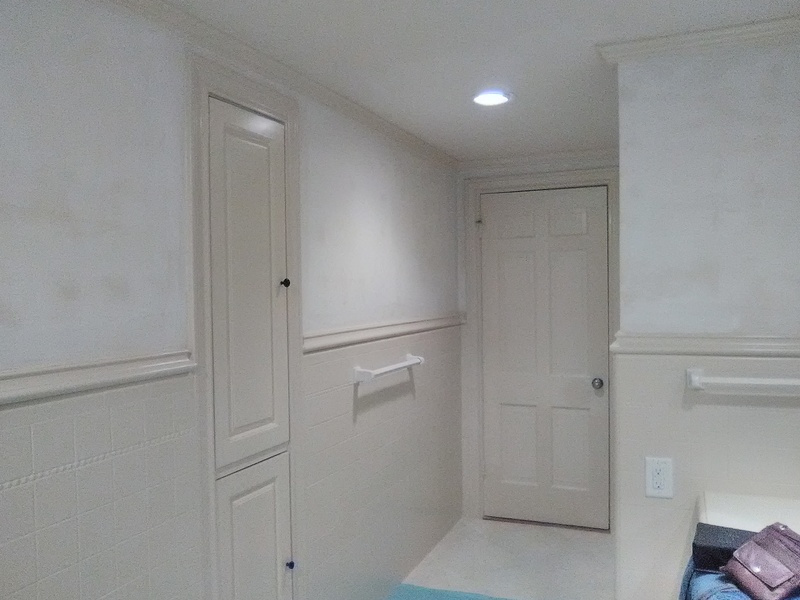 Originally a bland tan with a thick wall texture, the powder room was large – but that’s about all it had going for it. Unlike the other patterns chosen for this home, which are quite dramatic (see previous posts), this one is serene and fades into the background. 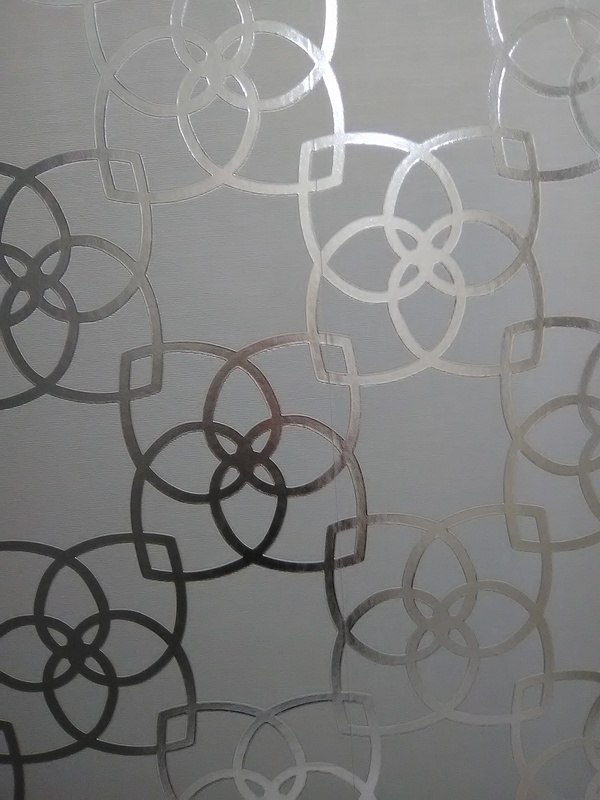 But the white background combined with the shimmer of the metallic ink add a lot of brightness to the space. 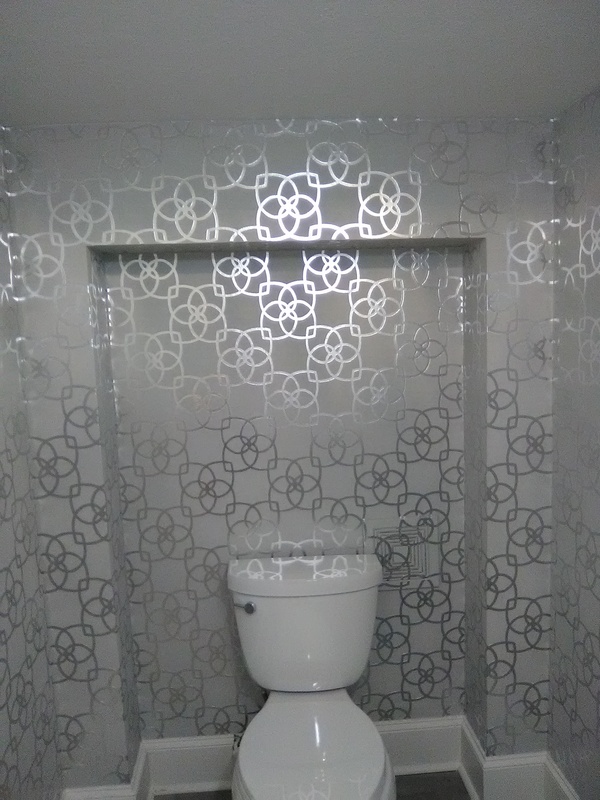 The homeowner also did a great job of coordinating colors and themes in the wallpaper with the tiny mosaic squares of glass tile backsplash around the vanity. 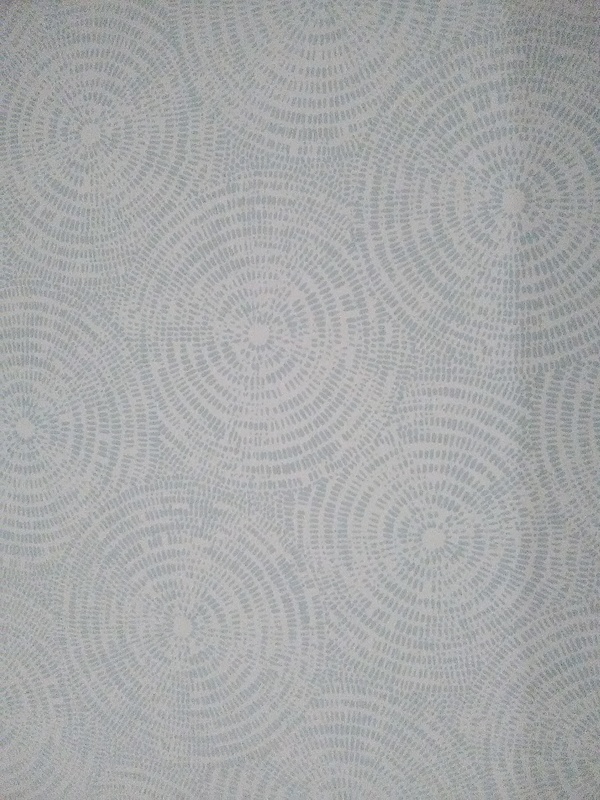 This wallpaper pattern is by A Street Prints. It is a thick non-woven material, and will hold up a little better to splashes and little hands than a paper-paper. 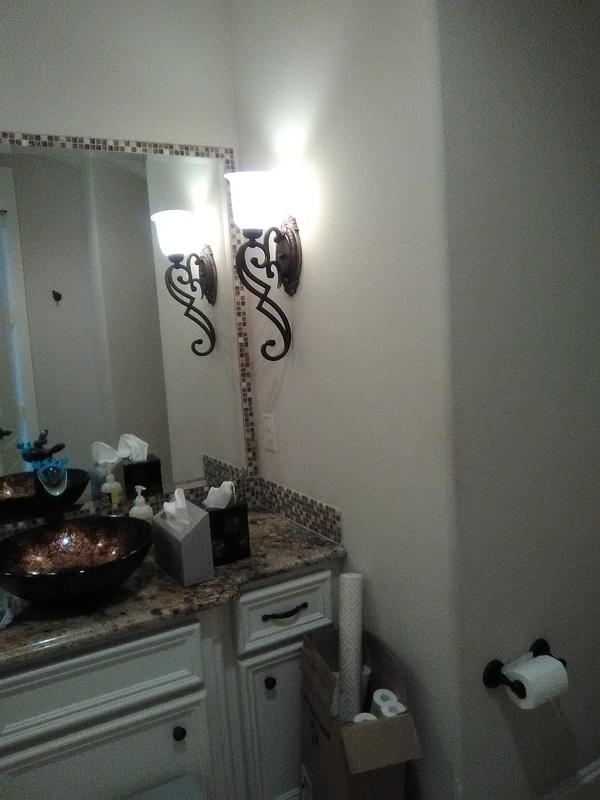 It is designed to strip off the wall easily when it’s time to redecorate. 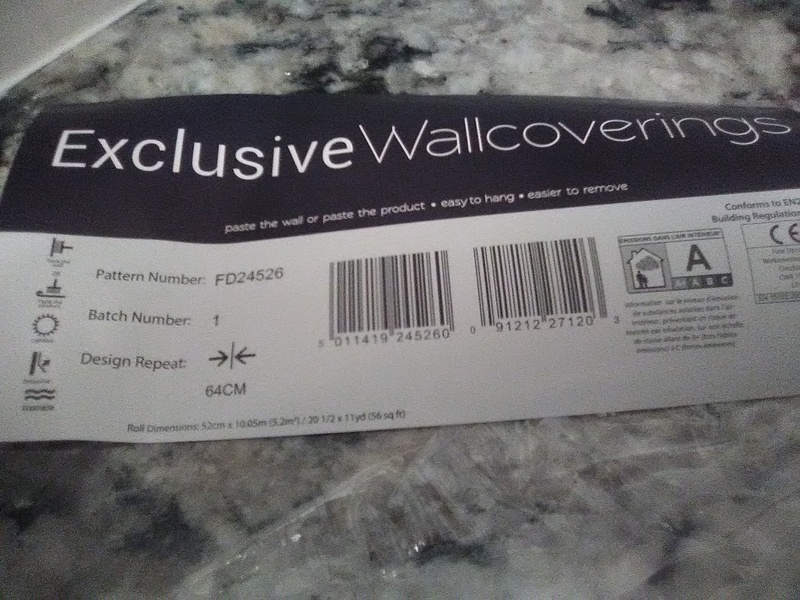 You are supposed to hang it via the paste-the-wall method, but I prefer to paste the paper. In fact, with the two rounded (bull-nosed) outside corners in the room, as well as a few other difficult features, I really needed the extra pliability that pasting the paper provides. It is prone to crease easily, so needed special care in handling. 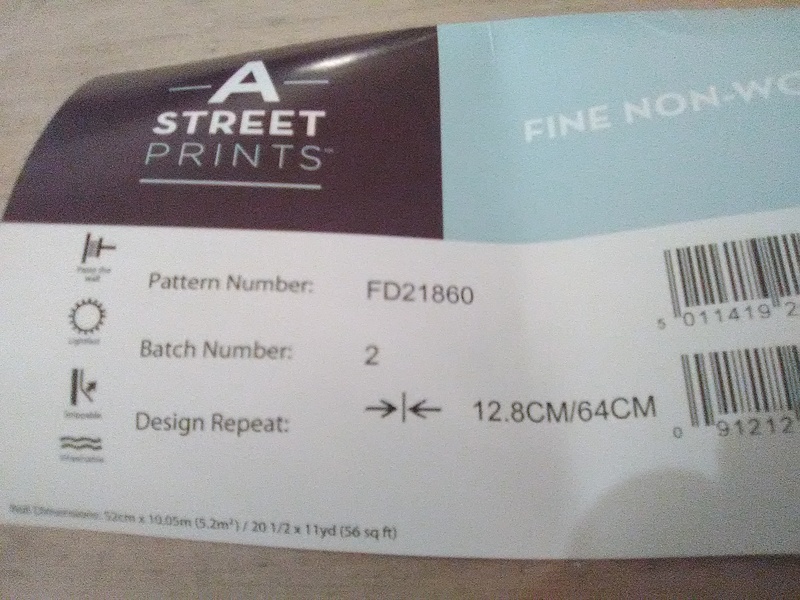 Also, there were two full bolts / double rolls that had printing defects. See third photo. Although these defects were minor, with such a plain pattern, they did tend to be pretty noticeable. I’m glad I had enough paper to cut around them, and was able to get the room done without any jarring defects. 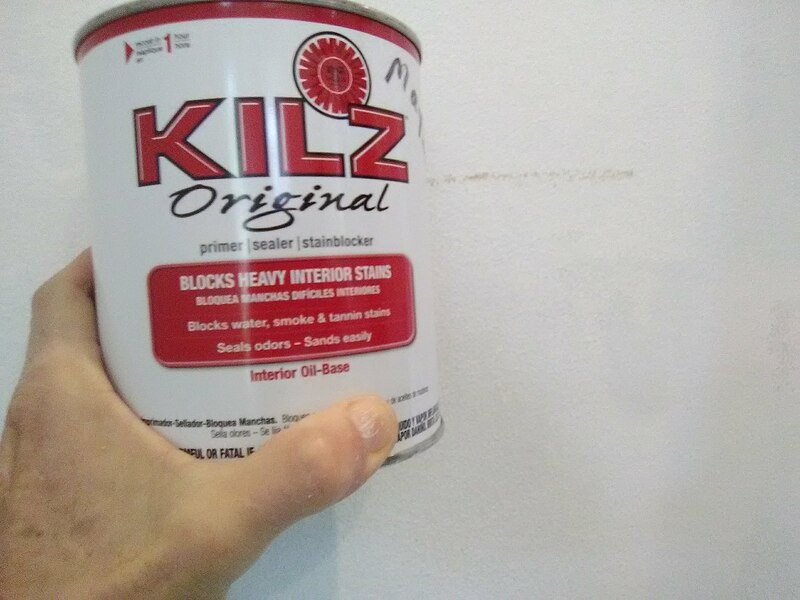 This paper was bought from my favorite source for good quality, product knowledge, expert service, and competitive price – Dorota Hartwig at Southwestern Paint on Bissonnet near Kirby. (713) 520-6262 or dorotasouthwestern@hotmail.com. She is great at helping you find just the perfect paper! Discuss your project and make an appointment before heading over to see her. This room (the whole house, really) is so well pulled together, it’s hard to believe the homeowner did it all herself – no interior designer was involved. I think she did a stellar job! This is the same house I blogged about yesterday, where everything started out a generic and lifeless tan. The homeowner is adding personality and cheer through color and pattern. Look at how well it’s working! 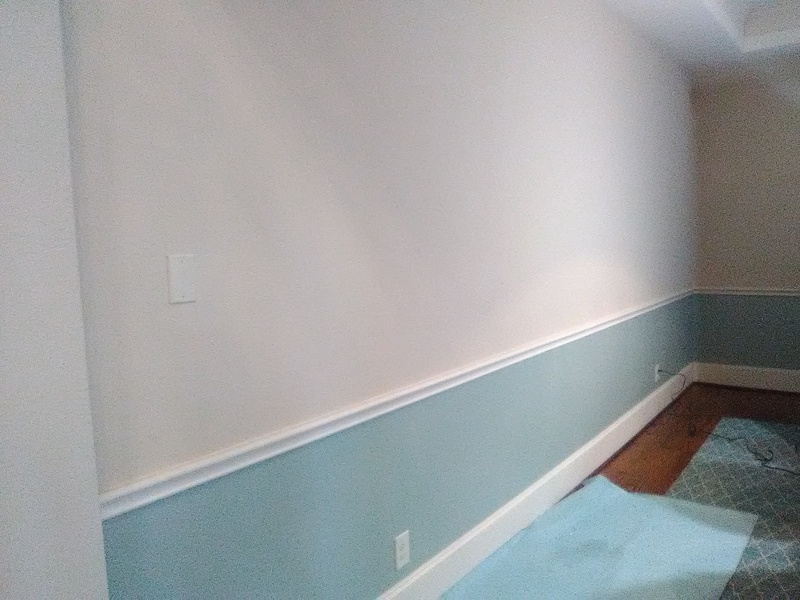 The area below the wainscoting in this dining room has been painted a beautiful aqua color. 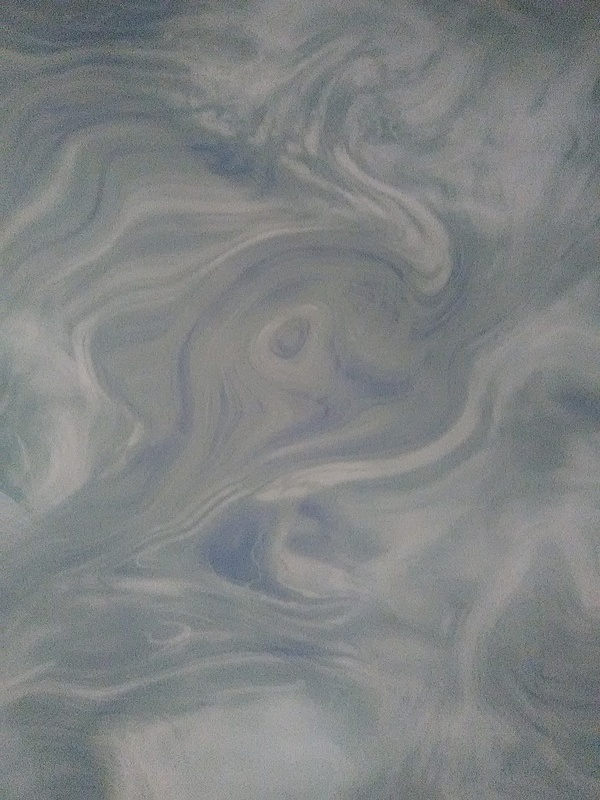 The faux-finish swirl-style wallpaper is hued in the exact matching tones, and looks fabulous in the room. 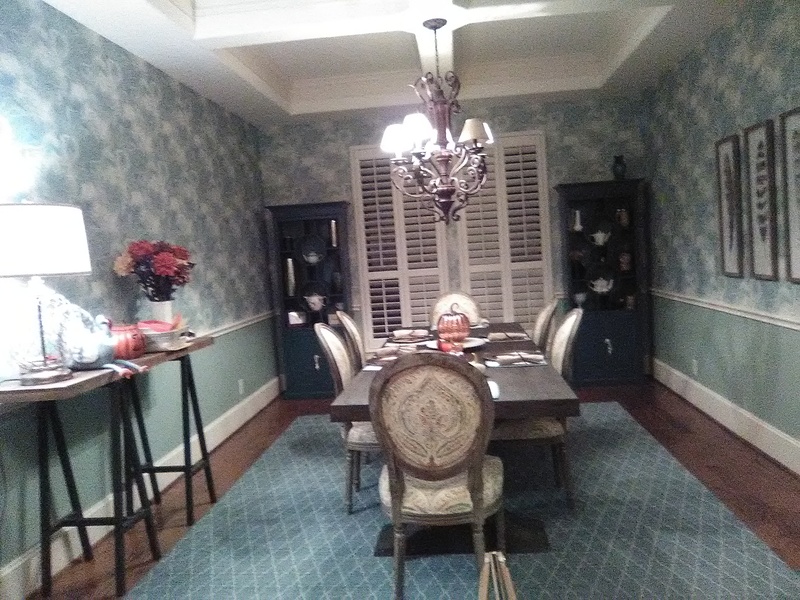 There are two corner china cabinets painted a dark aqua, that will really set the room off! This home is in the Garden Oaks neighborhood of Houston. 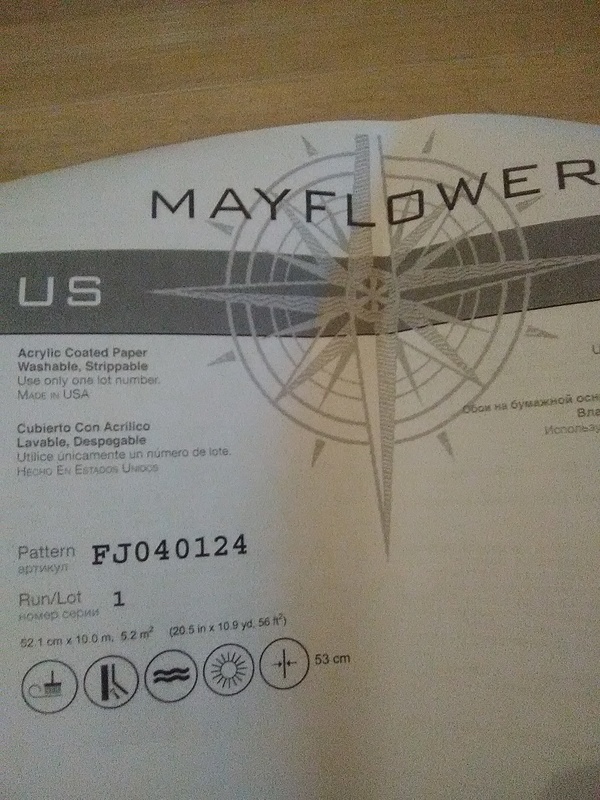 The wallpaper pattern is by Mayflower, and is a paper product. It was bought from my favorite source for good quality, product knowledge, expert service, and competitive price – Dorota Hartwig at Southwestern Paint on Bissonnet near Kirby. (713) 520-6262 or dorotasouthwestern@hotmail.com. She is great at helping you find just the perfect paper! Discuss your project and make an appointment before heading over to see her. You are currently browsing the Wallpaperlady's Blog blog archives for November, 2018.